My childhood was spent in the 1960s and 1970s when Flower Power was a big thing: my friends and I had floral wallpaper on our bedroom walls and schoolbook covers, and big flowers splashed across a lot of our clothes. In 1972 Rick Nelson’s “Garden Party” was on the radio seemingly non stop. It was a natural thing for his song to be stuck in my head the entire time I was knitting this shawl. This profusion of flowers makes this old flower child’s heart sing. This triangular shawl has an unusual construction. 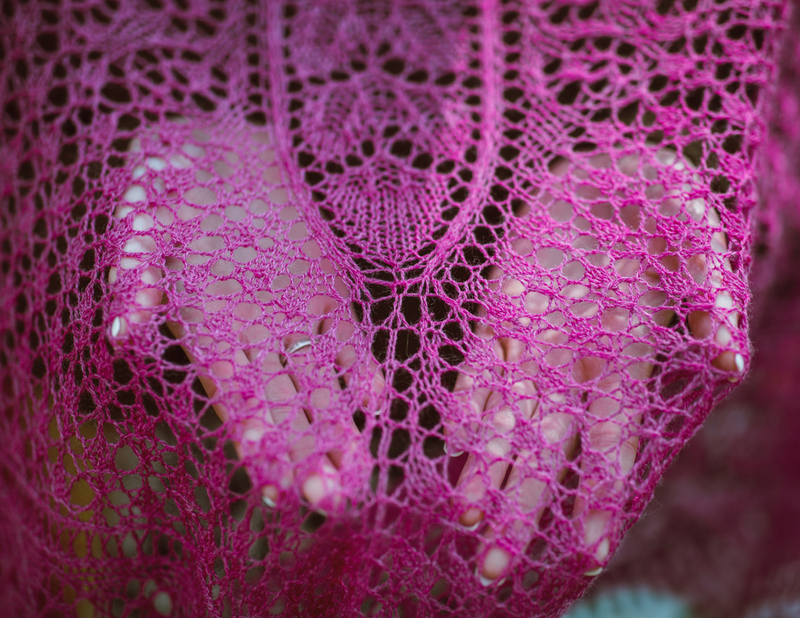 Knitting starts in the middle with the base of the central leaf panel, followed by floral triangles to left then right of center, before more flowers are sprayed across the bottom of the shawl, leading up to the lower edge. A wide applied border is added as a final finishing touch. Yarn: Lace weight, 900 yards. Model: JaggerSpun Zephyr Wool-Silk 2/18 in Dianthus. Gauge: 18 stitches to 4 inches in lace stitch, blocked. Finished size: 81 x 35 inches.